Set on Galveston Island, this beachfront hotel is just a short walk from the Galveston Island Historic Pleasure Pier. Ideally located on Seawall Boulevard, guests an enjoy views overlooking the beach and the Gulf of Mexico. Many of the guest rooms and suites offer private balconies with sweeping ocean views. In Galveston, enjoy a wealth of family-friendly activities, water sports, lively entertainment, and a variety of shopping opportunities. 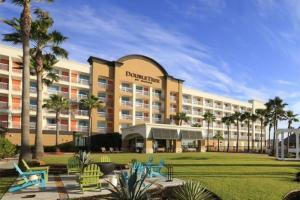 Located in Galveston, Texas, approximately 43 miles from Houston's William P. Hobby Airport.